That the same spice can have different names is nothing new; for example, cumin is sometimes called comino in areas such as Texas. Spices can also take different forms, such as onion powder and dehydrated onion bits. Sometimes the different names are just a matter of preference, and that’s the case with cinnamon -- the spice-shaker-appropriate form is known as both ground cinnamon and cinnamon powder. Cinnamon is the name given to different types of tree bark used as a spice and also serves as the genus name. Cinnamomum verum, or C. zeylandicum or Ceylon cinnamon, is considered real cinnamon, but Cinnamomum cassia, or Chinese cinnamon, is more commonly sold in the United States as cinnamon. Harvesters cut the inner bark of the tree into the curled “sticks” you can find in markets, and the bark is ground up into powder. Cinnamon’s everyday uses include seasoning and flavoring foods, and contributing its spicy scent to potpourri. You can eat cinnamon powder “uncooked,” for instance, sprinkled on toast, or you can add it to foods like oatmeal while the cereal is cooking. Be aware that cinnamon is a classic case of a little going a long way, and it’s relatively simple to overestimate how much you might need. Cinnamon powder can also be messy if you spill it, and if you leave some sitting on a dish for too long, it can stain the dish. A quick scrub with a paste of baking soda and water should remove the stains. Grinding up cinnamon makes it easier to flavor foods, of course, but the powder also has another advantage over stick cinnamon. You can use powdered or ground cinnamon to control pests. While cinnamon powder won’t kill ants, it can certainly corral them and deter them. Sprinkle a thick line of powdered cinnamon to block ants from traveling around your home and limit their range once you’ve located an entrance. The bugs appear to dislike climbing over the pungent powder. Replace the cinnamon every couple of weeks, as humidity can make it solidify, allowing ants to cross over it. Cinnamon has become something of a health star, surprising even researchers at its ability to affect blood glucose levels in people. In 2003 “New Scientist” reported on research at the USDA’s Human Nutrition Research Center. Researchers looked at how foods affect blood sugar levels and found “by accident” that apple pie, which normally contains cinnamon, did not raise blood sugar levels. In fact, it lowered them. 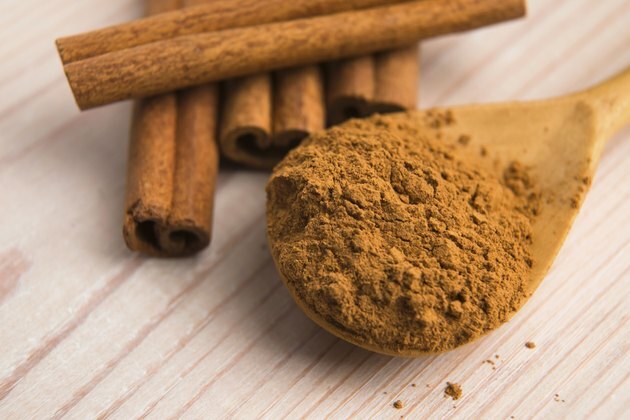 Further research by the same group found daily intakes of up to 6 g of cinnamon after meals lowered blood sugar levels in Type 2 diabetic subjects by as much as 20 percent. The effect was intake-dependent, though, and reversed if the subjects didn’t take cinnamon. The study was published in “Diabetes Care.” Another study published in “Diabetic Medicine” in 2010 also expressed optimism about cinnamon’s ability to control blood sugar and blood pressure. A 2009 study in “Diabetes, Obesity & Metabolism” was more cautious, noting further research would be necessary.